What is FinancialForce Billing Central? 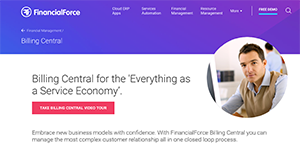 FinancialForce Billing Central is a cloud solution that unifies accounting operations, revenue management, and billing on the Salesforce Platform. With this application, you can manage your customer relationship tasks in a single closed loop process. On top of that, you can centralize your products and subscriptions, and make use of quantity breaks and flexible pricing schemes. Within Salesforce, you can automate taxation and billing operations, and change and manage contract renewal. The platform includes intuitive-to-use processes and provides complete visibility on the full customer lifecycle. With Billing Central, you would be able to: avoid duplication of objects and data in Salesforce CRM, gain full control of revenue sources on a single platform, make use of real-time cloud reporting for customer and revenue analytics, visualize the full customer lifecycle, benefit from its integration with Salesforce CRM which provides 360-degree customer visibility, support volume- and tier-based pricing, and finally, combine billing sources across various customer contract types. The best part about FinancialForce Billing Central is the learning curve is short and easy. The platform is simple to use yet robust, and offers ideal features for small and large businesses as well as service-oriented companies. They can utilize it to make their processes more efficient at an affordable cost. Billing Central integrates with the Salesforce accounting application to leverage the power and flexibility of the Force.com cloud platform. Thus, its uses extend beyond basic transaction processing and bookkeeping. Billing Central also integrates with Salesforce CRM which means your team members can access and work on a single secure record system to achieve more efficiency and consistency in their work. On Billing Central, you can easily raise invoices through any Salesforce CRM activity. Plus, you can give your clients installment payment options on a single invoice. In addition, setting up recurring bills is a one-time process. The app gives you a reliable audit trail as you can track all transactions posted on Financialforce. It tells who posted a specific transaction and who modified it. Thus, you can get a seamless audit trail. The bank reconciliation feature tells you the correct state of your finances. Typically, there is a difference between the bank balance and book balance of a business. Billing Central tells you which bank statement transactions are not showing in the platform. Thus, you get to know what transactions have been recorded and not recorded which helps you understand the proper financial status of your company. A key benefit is Billing Central takes care of check printing which makes it simple for you to issue checks to suppliers and other parties. Finally, the app supports credit processing which means you can collect your due payments easily and quickly. In short, with Billing Central, you can use the same cloud platform to manage billing that your company’s services, sales, and customer support teams are utilizing. Every business is different, and might need a special Accounting Software solution that will be fit for their company size, type of clients and employees and even particular niche they deal with. You should not count on getting a perfect software that will work for every business regardless of their background is. It may be a good idea to read a few FinancialForce Billing Central reviews first and even then you should keep in mind what the solution is intended to do for your company and your employees. Do you need an easy and intuitive solution with only elementary features? Will you actually make use of the complex functionalities needed by pros and big enterprises? Are there any specific features that are especially beneficial for the industry you operate in? If you ask yourself these questions it is going to be much easier to find a trustworthy app that will match your budget. How Much Does FinancialForce Billing Central Cost? Billing Central enterprise pricing information is not available on the product website. Contact FinancialForce for pricing details. We realize that when you make a decision to buy Billing and Invoicing Software it’s important not only to see how experts evaluate it in their reviews, but also to find out if the real people and companies that buy it are actually satisfied with the product. That’s why we’ve created our behavior-based Customer Satisfaction Algorithm™ that gathers customer reviews, comments and FinancialForce Billing Central reviews across a wide range of social media sites. The data is then presented in an easy to digest form showing how many people had positive and negative experience with FinancialForce Billing Central. With that information at hand you should be equipped to make an informed buying decision that you won’t regret. What are FinancialForce Billing Central pricing details? What integrations are available for FinancialForce Billing Central? If you need more information about FinancialForce Billing Central or you simply have a question let us know what you need and we’ll forward your request directly to the vendor.